Google is all set to install its first floating solar plant in Taiwan, Asia. This will also mark Google’s first renewable energy project in Asia. This floating solar project will be different from what seen elsewhere, as the company will use poles to hoist the solar panels on top of them, unlike pontoons or floating structures used. Floating solar structures are gaining popularity for their various ecological advantages. These structures are known to reduce evaporation and also result in better efficiency levels of the operating solar structure. The floating solar project by Google will involve placing solar panels atop a series of fishing ponds in Taiwan. The project design could result in improvement in fishing yields. Since panels will be situated atop poles, there will still be enough room for fishes to breed while also providing them with shade. 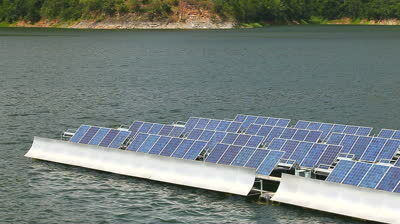 Floating solar on water technology is environment-friendly, as it reduces evaporation and checks on algae growth. It reduces water evaporation from water bodies and also minimizes the risk of solar cell performance atrophy. Water is a scarce resource and we are losing water due to excessive evaporation. Floating solar could also be used as a means of water conservation. It is estimated that one square meter of water surface covered by floating solar panels could save more than 1,000 liters of water annually. Google is one of the largest technology companies that is aggressively expanding its clean energy footprint. The company has signed more than 30 solar and wind projects across the Americas and Europe. Google operates huge data centers which are big power consumers. As a part of Google’s 100% renewable energy target, the company has been buying clean energy power, even from various off-beat locations around the world such as the Atacama Desert. Google has partnered with Diode Ventures, Taiyen Green Energy, J&V Energy and New Green Power for this 10 MW canopy solar project in Taiwan. The company had made a purchase under the 2017 Taiwan Electricity Act, which allows non-utility companies to purchase renewable energy. It is on track to be completed by 2020. Asia has seen a surge of interest in floating solar projects. Dense population and non-availability of land make floating solar very attractive in Asia.